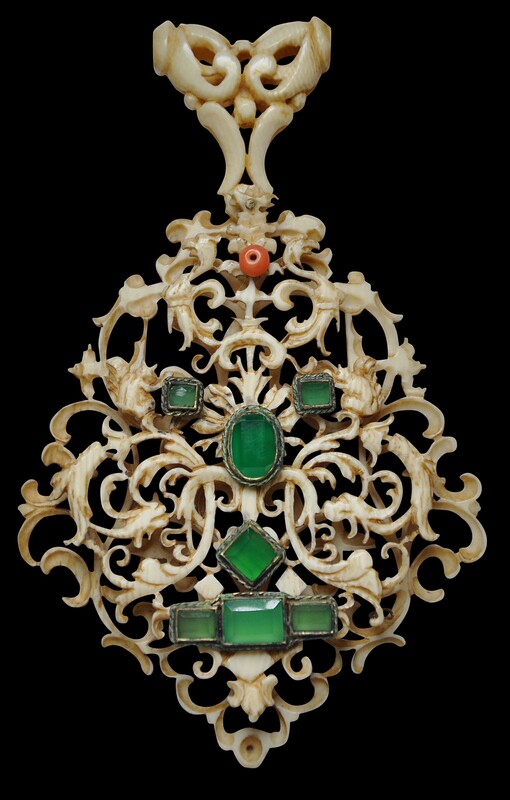 This rare and unique pendant of the first half of the seventeenth century is made of ivory and almost certainly in China. 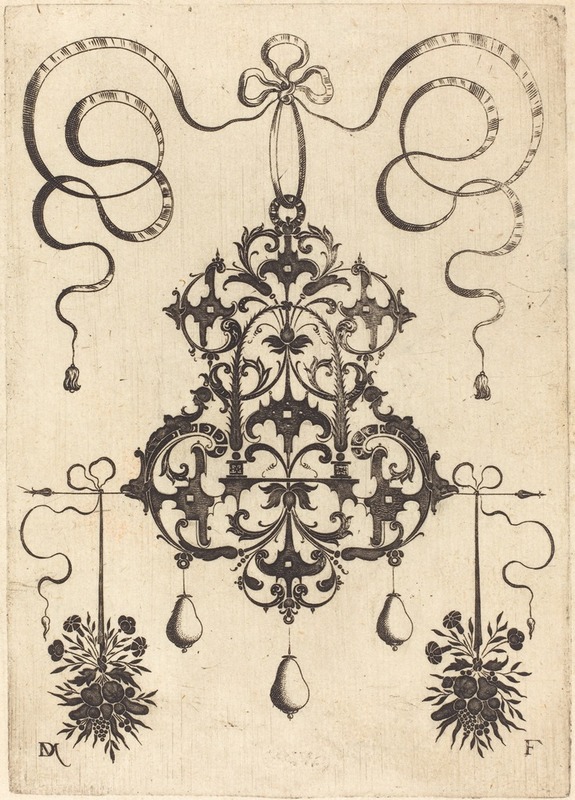 The scrollwork designs of both front and back are based on ornamental prints by the Augsburg-based Huguenot engraver Daniel Mignot and his contemporaries. (See below for examples of Mignot’s engravings, and here for examples in the Victoria & Albert Museum.) The basic design of the pendant is West European and of the Renaissance period, however other details suggest a Chinese provenance. The goldsmiths of the Renaissance period would have transferred such designs into models made of lead or other metals before making the final object in gold. Examples made of ivory are hitherto unknown, the use of this material suggests and gives further confirmation of an Eastern provenance. 大 – this symbol appears twice – once in the conventional manner and then again in reverse. (The use of the symbol is in keeping with Mignot’s strictures for symmetricity). 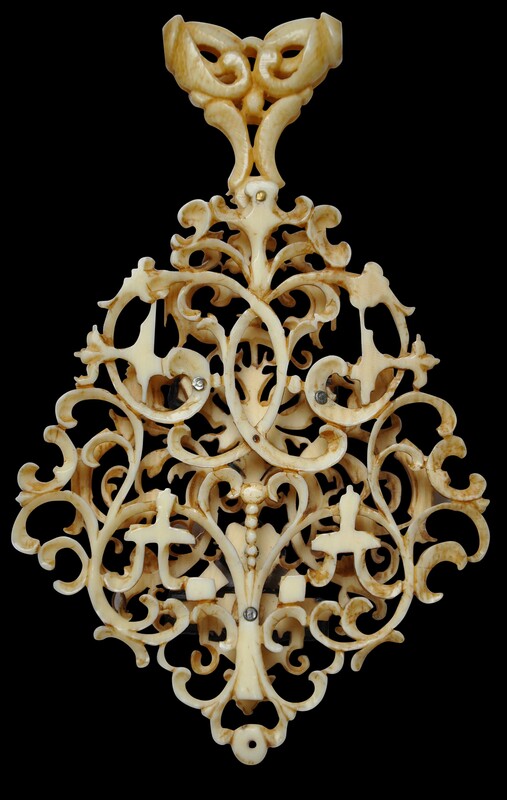 The pendant itself consists of a front and back plate – each carved from a single sheet of ivory. Both plates are attached to each other by small ivory studs strengthened with tiny white metal rivets. The craftsman who carved the ivory pendant must have known or had in his workshop copies of printed ornamental designs by Daniel Mignot. The scrollwork on the front plate of the pendant resembles his engravings of such jewels. Scrollwork was fashionable in Europe between 1570 and 1620. The jewellery designs of Daniel Mignot from the 1590s were of great relevance, and typical of his work of this period is the three dimensional style of the scrollwork and inclusion of grotesque figures and animals. On the ivory pendant are carved in the upper part in mirror image two stylised griffins and just below two squirrels. Such elements can also be found in the engravings of the Master P.R.K. who was his contemporary and active in the Netherlands in the first quarter of the seventeenth century. A further confirmation of this date is a small detail on the back plate of the pendant a ‘pea pod’ ornament between the two ‘da’ symbols. The ‘cosse de pois’ or pea-pod ornament is a characteristic feature of swirling botanical designs with stylised elements originally from France, but was en vogue in European ornamental prints and goldsmiths’ work from about 1615 to 1640. On the front of the pendant are seven stones with bevelled edges in varying cuts and sizes set in gilded box mounts with twisted wire decorations. It can be assumed the gemstones were originally emeralds, which a later owner had replaced with the current ones of stained green chalcedony imitating emeralds. These later replacements date to around 1920 when such stones were fashionable in jewellery, either the owner wished to raise funds from the emeralds, or chose stones with a deeper green than the originals. Quite possibly it was at this stage that the coral bead was added, and it is likely to have been a loose bead from a rosary which was widespread in Catholic regions in Europe, in particular in Italy, Spain and Portugal. Wealthy Iberians of the seventeenth century were known for their preference for rosaries made of coral, which were also in use in their colonies, such as the Philippines and Macau (see d’Orey, 1195, p. 34). 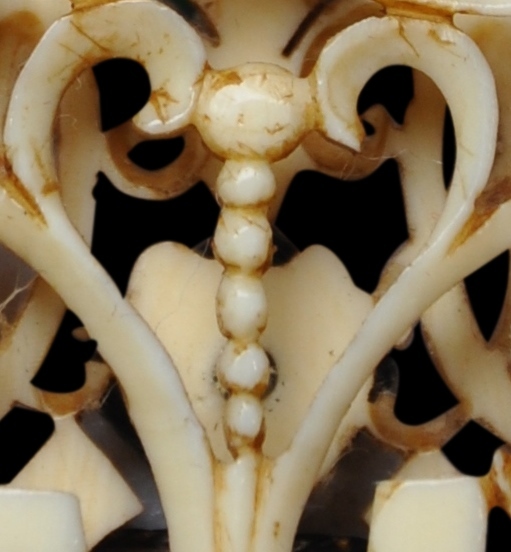 The intricately carved pendant loop shaped like a pair of finger citrons was either carved from a different piece of ivory than the pendant at the time of production, or maybe at a slightly later date it replaced a Renaissance style scrollwork loop, which even in gold were fragile. There are, however, other examples of jewels that appear to be based on Mignot’s designs which incorporate elements based on clasped hands. See for example two pendants attributed to early 1600s Germany in Szilagyi (2004, p. 115), both of which incorporate pairs of hands as part of their design. 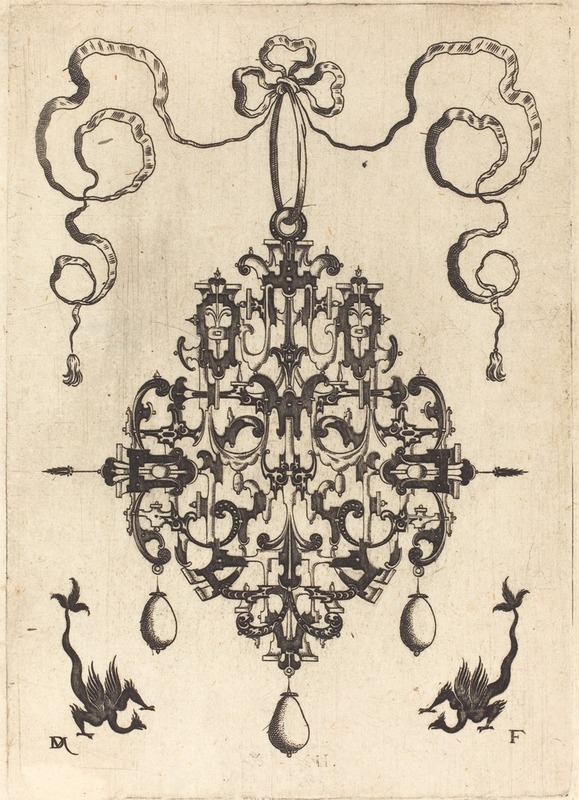 Surviving Renaissance pendants and the ornamental prints by Daniel Mignot show that drop pearls were often suspended from pendant loops along the lower rim, depending on the design either a single pearl or three pearls. 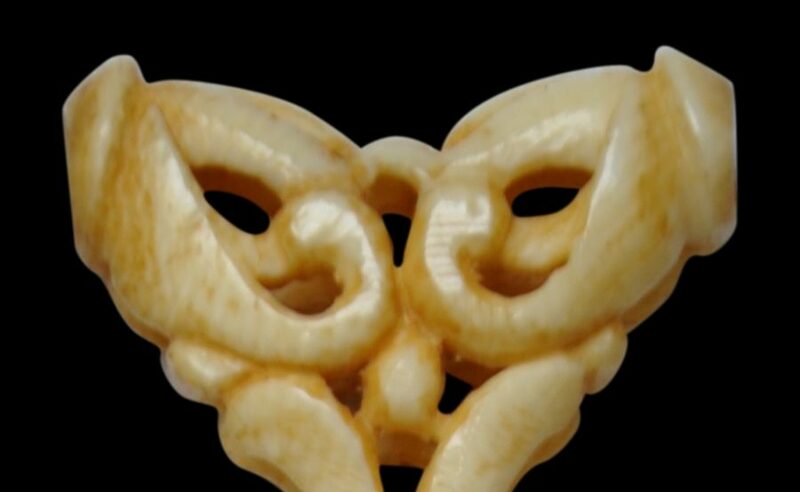 Along the lower edge of the ivory pendant there are drill holes which suggest that there would have been three pearl drops suspended. Daniel Mignot was a French Huguenot (Protestant) who worked in Augsburg in the early seventeenth century. His ornamental prints with numerous designs for jewellery were published between 1596 and 1616 and distributed widely. A characteristic feature of his scrollwork and strapwork patterns is the symmetry and unusual stylisation of forms (Evans, 1951, p. 132). The goldsmith or as in this case craftsman carving the fine ivory plaques would have been inspired by such ornamental prints, either by Daniel Mignot or other contemporaries, and adapted them to meet their aesthetics. The pea-pod ornament would have come from another source, such as Gilles Legaré or B. Le Mersier, to name a few. How did such engravings of Daniel Mignot reach seventeenth century China? The Jesuits are one possible route. When the Jesuits first established a presence in China in the first half of the seventeenth century, they noted the Chinese respect for books and learning. They realised that access to the Court could be facilitated by providing Western books and the like, which matched the interests of the science-literate Jesuits. The shared appreciation for knowledge and scholarship as well as the Jesuits’ decision to learn to read, write and speak Chinese became important tools for their evangelisation in China (de Grijs, 2015). The Italian Matteo Ricci was the most prominent among the early Jesuits, and he introduced Western science, mathematics, astronomy, and visual arts to the Chinese Imperial Court. It is thus possible that an early introduction of European books included such designs. The jewellery historian Beatriz Chadour-Sampson who was the consultant curator for the new William & Judith Bollinger Jewellery Gallery at the Victoria & Albert Museum, co-curator for the V&A’s 2013-14 Pearl Exhibition, and who also worked on the treasure of the Nuestra Seňora de la Concepción which sank off the coast of the Mariana Islands in 1638 on its way from Manila in the Philippines to Mexico has examined this piece. Its styling was known and can be traced in the jewellery found in the Nuestra Seňora treasure that Chinese craftsmen were commissioned by the Spanish to make in the European style for trade with Europe. According to her this pendant is a unique example of its kind and of high workmanship, it is also a typical example of jewellery made in the Western European style intermingled with Far eastern iconography. The pendant is in excellent condition. There have been some modifications, most notably with the replacement of the green gems, it is however rare to come across examples of Renaissance-era pendants that have not been modified in some way. 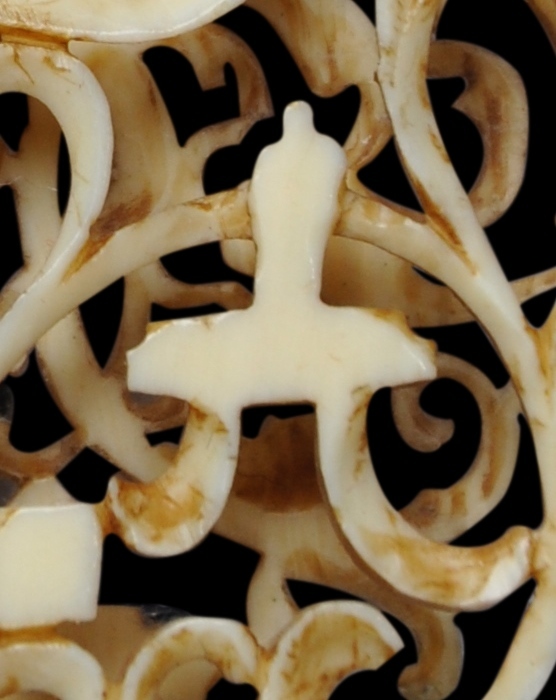 Remarkably, there are no losses to the intricate ivory tracery, and no repairs. Two Designs for Large Pendants, by Daniel Mignot, 1596. The Chinese symbol for ‘da’ or ‘big’ worked into the back of the pendant. Cavey, Christopher, personal interview in September 2015. Chadour-Sampson, Beatriz., personal interview in September 2015. Evans, J., A History of Jewellery 1100-1870, Faber and Faber, 1951.
de Grijs, R., Review of Libraries of Western Learning for China: Circulation of Western Books Between Europe and China in the Jesuit Mission (CA 1650 – CA 1750) by Noel Golvers’, in Journal of the Royal Asiatic Society, Vol, 25, Part 3, July 2015. O’Neill, J.P., (ed. ), The Jack and Belle Linsky Collection in the Metropolitan Museum of Art, The Metropolitan Museum of Art, New York, 1984.
d’Orey, L., Five Centuries of Jewellery: National Museum of Ancient Art, Lisbon, Zwemmer Publishers, 1995. Szilagyi, A. (ed. ), Hungary’s Heritage: Princely Treasures from the Esterhazy Collection, Paul Holberton Publishing, 2004.